Next in our online records series are the websites of the city archives of the three largest Dutch cities: Amsterdam, Rotterdam and The Hague. Amsterdam and Rotterdam do not have any records in Genlias, and The Hague only a few, so the websites of the city archives are the main online sources for these cities. Today we will look at the website of the Amsterdam city archive, Rotterdam and The Hague will follow in the next few days. The part the of the website of the Amsterdam city archive where you can search for records is called Archiefbank (archive database), this is the part of the website we will look at today. The website has more to offer, but that's currently all in Dutch. We will look at the image database in a later post. In this post, we will look at Doopregisters (baptisms), 1564 - 1811, and Gezinskaarten (family cards, part of the population register), 1893 - 1939. There are several other databases on the sites, and many scanned but not indexed collections. Update (summer 2009): In the meantime, the Amsterdam city archive has created an English interface. The website is not easy to navigate, especially if you don't speak Dutch. I will discuss the doopregisters and gezinskaarten databases and give you direct links to the search pages. If you want to search the other databases, the best place to start is here. Let's start with the doopregisters (baptism registers) from the Amsterdam church books. On the search form you can fill in two names, one in the left column, one in the right column. If you want to search for a single name, just fill in the left column. There are fields for given name (voor), infix (tussen), and surname (achter). Check the Fuzzy box if you also want to find similar names. If you want you can select a time frame (periode), fill in the first and last day/month/year (in this order!) of the time frame you want. Look at the example below to see how I filled in the form, looking for children of the couple Adrianus Koopman and Johanna van Grol baptized between 1770 and 1790 (click on the image to enlarge). When you have filled in the form, click the Zoek button (the black arrow on the right). With the search form filled in as in the example, I found three search results. Hovering over the results shows the details. On the image below, you see the baptism record of dochter (daughter) Johanna. To the right of the record is a small image of the scan of this record, with the text klik op de thumbnail om scan te openen (click on the thumbnail to open the scan). If you click it you will be asked to logon: You need to be a registered user to download scans, and you need to pay for them! I have an account, so I logged in, paid, and downloaded the image. Once you have paid for a scan, you can come back later, log in again, and view it again, you will not be charged again for the same image (but your account will be closed if you don't use it for a year). Usually, the scan will not have more information than is already available from the index. The search form for gezinskaarten is quite simple. 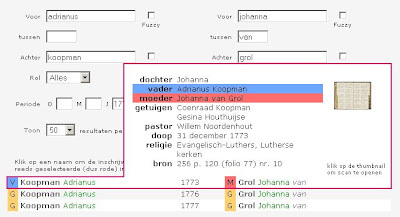 You can only search for the head of a family, and there are only four search fields: Voorletters (initials), Tussenvoegsel (infix), Achternaam (surname) and Geboortedatum (date of birth). Press the pink Zoek button to search. In the baptism records we just looked at, all the information available in the original records is also available in the index. Unfortunately, this is not the case for the gezinskaarten index: The search results have very little information, not even the full name! If you want to know more, you will have to pay for the scans. Searching and browsing the index is free. Prices for viewing and downloading scans vary from €0.50 for a single scan to €0.25 per scan for orders over 1,000, plus a transaction fee between €2.50 and €7.50 (depending on payment method). Paid but unused scans will be credited to your account, credits are valid for one year. If you need multiple scans, make sure you pay for all your scans at once, to avoid multiple transaction fees. On the login window, you can select Ik wil mij nu registreren (I want to register now) to register. Registration and payment pages are also in Dutch. The databases we discussed are part of a larger scanning project. Many of the collections that are kept by the Amsterdam city archive are already scanned, and customers can ask for scanning of collections that are not scanned yet. When you browse the inventory of the archive, you can see in the last column if a collection is scanned, and if so, how many scans there are. You can browse the collections of the Amsterdam city archive, buy scans that are already available, or order scans when they are not available yet. Eventually, a large part of the collections will be scanned and made available online, but not indexed, and thus not searchable. The user interface is clumsy: The site is hard to navigate, there is no English interface, search interfaces are inconsistent (on one search form you have to click a black arrow to start searching, on another a pink button). There is a lot of room for improvement here. It would be nice if the gezinskaarten index contained more information, especially since the scans are often difficult to read. It is, however, a miracle that there are scans of the cards at all, as most of them were lost or heavily damaged in 1943! Fortunately for us, the cards were microfilmed in 1939. The films do show some wear and tear, after decades of use. It is interesting that while many archives are busy indexing their collections online, the Amsterdam city archive focuses on scanning instead. It is good to see so much information available online. On the other hand, the goal should be to make information more accessible, and an easy to navigate website, preferably multilingual, would help to achieve this. Amsterdam records are not in Genlias (but behind the screens a lot of people are working on indexing Amsterdam marriages for Genlias), and the main sources for online genealogy in Amsterdam are the pre-1811 baptism books, and the post-1893 gezinskaarten, leaving most of the 19th century unindexed. This website is not aimed at casual ancestry searchers. If you are new to Dutch genealogy I advise you to wait for Genlias, but for an experienced researcher that knows some Dutch the archiefbank can be an extremely valuable resource. My 2x great-grandmother was born on a ship that was located off of the coast of Holland on 14 Aug 1817 and lived to be 98-years old. In the words of Catherine BUMGARDNER Raudebaugh, the ship "April" was "blowed off course". Well, I came upon the amazing story of the ship HOPE. Connecting dots, I speculated that the words HOEPEL and APRIL sound the same, the suspected dates are the same, and the conditions of going off course are the same. Many years ago, Mr. Ronald Gase of the Netherlands replied to an email query of mine that Jacob Baumgartner was listed as a head-of-household on the ship HOPE. Mr. Gase suggested researching Johan Lodewijk Baumgartner, a Lutheran, who married in Amsterdam in 1796 AND checking the baptismal records for Amsterdam 1564-1811. Can anyone help me with this research to identify my 3x great grandparents and to find Catherine’s birth record? Would this birth have been recorded in Holland? It's interesting that Catherine considered herself Dutch; although her father's surname is German. Back then, what legally denoted a nationality -- country of birth or ethnicity of parents? Perhaps she could have been the first recorded hyphenated national -- German-Dutch??? AND why would Mr. Gase suggest Johan? Although he would have been of correct age, isn't the Johan moniker the same as JOHN in English -- not Jacob??? Dear Blog-Monitor (what a title! ), Please respond to my email of yesterday to the posted address, bundy@cvip.net. I neglected to check that box as an appropriate method for correspondence.